This pot is typical of the large class of functional, domestic unglazed stonewares made in the Sawankhalok kilns. It was produced at Ban Ko Noi village, located about 6km north of the old city of Sawankhalok. Ongoing archaeological research indicates there were hundreds of kilns around Ban Ko Noi, making it a major production centre for Sawankhalok wares. 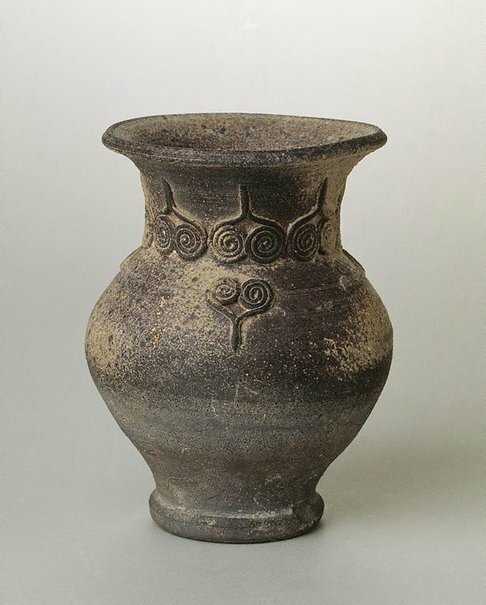 The decorative applied whorl motif is a purely Thai motif that can be traced back to the incised designs on bronze artefacts found at the ancient site of Ban Chiang. The Asian Collections, AGNSW, 2003, pg.328. Don Hein., Bulletin of the Art Gallery of South Australia [vol 38] , 'Sawankhalok kilns - a recent discovery', Adelaide, 1980. The Asian Collections Art Gallery of New South Wales , Sydney, 2003, 328 (colour illus. ).